A new catering/takeout/bakery just opened up in my neighbourhood in Toronto called Scratch Fresh Foods. It just opened, so there isn’t much, but it seems like it has potential. They seem like they are going to have a good amount of vegan and gluten-free stuff. So far they had tortilla chips, cooking sauces, macaroons(! ), soups and biscotti. They might also get in some vegan cupcakes and gluten free breads. The biscotti was delicious, but unfortunately I’ll be in India soon so I wont be able to check it out again until the end of summer! Man, I love getting mail. Even if it is stuff I bought myself. The bottom two cookbooks are books I’ve been meaning to get for a while. An entire book devoted to vegan cheeses? Ok. Also, the top two are India travel books. Oh that’s right, I’M GOING TO INDIA FOR 4 MONTHS. I’ll be sure to update my blog whenever possible with culinary delights to tickle your senses. I’m spending this long weekend at a friend’s cottage and felt the need to make treats! I made pumpkin chocolate chunk bars and brownies! I’m also making some salad rolls, a huge vat of peanut sauce for recreating the buddha bowl from Fresh, and some pancakes. It should be a delicious time! 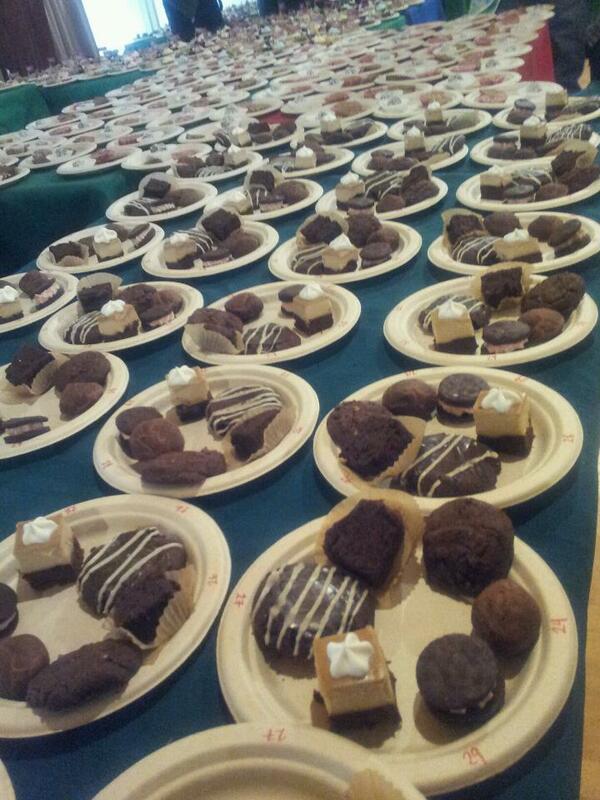 Well, I survived the Vegan Bake-Off! I didn’t win, but the cookie that did win was pretty awesome. 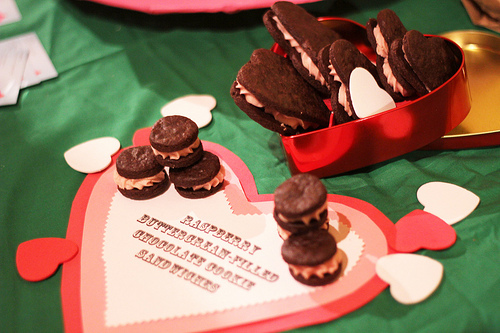 My entry was chocolate cookie sandwiches, filled with raspberry buttercream icing. I was going for a cheesy Valentine’s Day theme, and I think I succeeded. I made my own recipe, and it was fun to tweak it a few times by experimenting with different flours and ratios. On the morning of the bake-off, I managed to make and assemble 150 sandwiches in 3 hours. However, my icing was quite thick, and by then end of piping it into 150 sandwiches, my arm was pretty much numb, haha. So, as promised, here is my recipe! I didn’t manage to take any good pictures of the event, but there are some floating around the internets. –	Combine rice flour, sorghum flour, arrowroot flour, tapioca starch, xanthum gum, cocoa powder, baking powder and salt together. –	In a separate bowl, cream Earth Balance and sugar, then mix in the flax egg. –	Combine wet and dry ingredients together, and then mix in chocolate chip flakes. This will be a somewhat dry batter. You may add a couple of splashes of water to get everything mixed. You may even want to get right in there and mix it with your hands, to ensure it is all mixed together. *I made chocolate chip flakes by grinding frozen chocolate chips in my food processor until they were crumbly. Mix shortening and Earth Balance, blend in icing 1 cup at a time. Next, blend in raspberry jam. Depending on the texture of your jam, you may want to add a bit more jam to get a lighter icing. Pipe icing onto one cookie and top with another. Then eat all of them at once! Any place that has vegan and gluten-free waffles gets my vote for awesomeness. Everything in this place is served on or with waffles. I think they only had one vegan thing on the menu, but it was pretty great, so I don’t care. Oakham House is one of the student owned places on campus. They have all of their menu items labeled if they are vegan and/or gluten-free. Plus, it is cheap. I think my stir fry was $ 6. The sauce needed some help, but for a cheap meal, I won’t complain too much. They also have a veggie curry and soup options that are vegan and gluten-free. I also saw that they have gluten-free toast, but I’m not sure if it is vegan as well. I will probably come back here again, because the foods is cheap and they actually have some options for me! I love Butler’s Pantry. They have cheap and delicious food, and they have several vegan options on their menu. Their salad dressing is the best dressing ever! I almost always get the vegetable bhaji. It is pretty awesome. Lunch today was quinoa and lentils, broccoli, roasted cauliflower, avocado, chickpea salad, black bean salad, shredded beets and tahini sauce. I also got a magic square which was pretty awesome. Well, the title of this post is a bit misleading, as not much eating took place at Guu, a Japanese tapas-style restaurant. I went to the location in the Annex with a couple of friends. I first looked at the menu and couldn’t see anything that was vegan or gluten-free. I decided to go anyway, because I have always been able to find at least something at every restaurant I’ve been to (even if it is a boring salad or a baked potato). I asked the server what I could have, and apparently the only thing I could eat was the edamame. They didn’t even offer to make anything, which really sucked. I would not recommend this place to anyone looking for a gluten-free and vegan place, sadly. At least the drinks were ok….. This weekend I was helping out at the Toronto Vegetarian Association table at the Delicious Food Show. We had a really positive response at the show, with lots of people interested in vegetarianism and veganism, and lots of people who were already vegetarian coming to visit us. I was curious to see how this would go, as this festival had a lot of Food Network stuff happening, which usually means that there will be meat everywhere. Don’t get me wrong, there was still tons of meat. However, I was surprised that they had a natural food section. Our table was right by Daiya cheese. It was so funny to see people’s reactions when they read that the cheese was dairy-free. Pretty much everyone loved it, though, so that was awesome! Bunners was there, selling their delicious gluten-free and vegan baked goods. I got a cinnamon bun, and it was amazing. I have had limited success making my own cinnamon buns, and by limited, I mean none. Govinda’s was there was well! I picked up a jumbo tub of hummus from Sunflower Kitchen. I also got some wheel thing that I can’t remember the name of from the Tiffin people. It was really good. So, would I recommend the food show? Nope. It was almost 20 dollars for people to get in, and I would say that 20 dollars isn’t worth it for a small handful of booths that were vegan and gluten-free. But it was awesome to see all of these vegan booths at a very mainstream meat and butter lovers paradise. If I had to choose a favourite restaurant, Fresh would probably be it. I have all of their cookbooks and always make their recipes at home, but that doesn’t stop me from coming back to the actual restaurant. Their food is so good! This time I went for a special they were having that was basically every burrito filling you could think of in a bowl on rice, topped with hemp seeds. It was awesome. If you find yourself in Toronto, you need to go here. They’ve got a list of menu items that are gluten-few as well, if you aren’t sure what you can get. Go! Posthaste!